Get A Job! Can you think on your feet and interview for a job as the President or a Professional Cuddler with four ridiculous qualifications like Implants or Dingo Repellent? 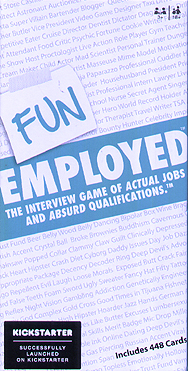 Funemployed is the crazy party game where each player is handed four random Qualification Cards to "build their resume". One by one, each player interviews using all four cards and has to talk their way into winning the job! But watch out! The manager has something up their sleeve too!